Now that the gorging segment of the holiday is over, let the drinking begin! 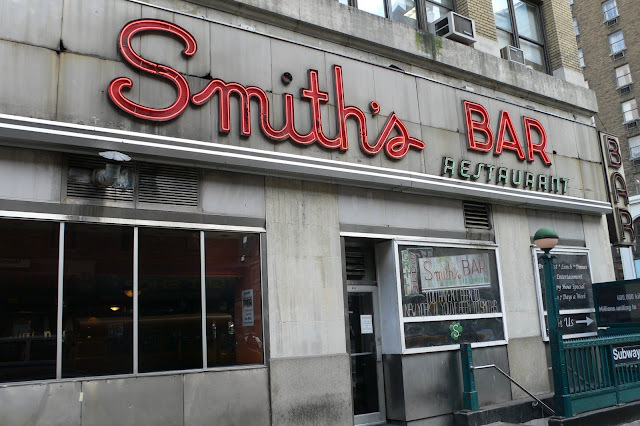 And what better establishment to get it started than Smith's Bar, a Times Square area landmark that has somehow retained its facade and remained in business. I really like these old signs. Something about them. Tho having several typefaces in one storefront is a little disconcerting. Yes, let's have a drink right here KM> I'll have champagne. SMith's does have champagne, right???? Well if they don't, just give me a good ole bourbon with club soda !HA Love the signage. Where do you find them all? I'm really enjoying the series of bar pics. Interesting signage and decor. You're making me thirsty. I just love all these cool signs! This looks like a good place to do it in too!! LOL!! Cheers! I would love to have a drink there. Who's buying? Love your photos, all of them, but I'm partial to neon signs, so those are my favorites. Really? I will have to go and explore this one - I work in the Times Square area and never stumbled on it. I am guessing it is more towards the 50ies & 8th ave? Gonna' need a lot of "refreshments" to get through the holidays. ;) Guinness or bourbon? I always used to shoot in AV mode. (i'm assuming you have a Canon). I forced myself into manual mode. there is a learning curve, but it can make a difference. you can adjust the shutter speed to correct for what the camera "thinks" is the correct exposure. (it usually isn't). Stop by tomorrow if you can and see one of many examples from the state where nearly nothing is allowed.